Weighty Matters: Are you eating North America's Least Healthy Breakfast Cereal? Are you eating North America's Least Healthy Breakfast Cereal? Can't say I've ever heard of it. 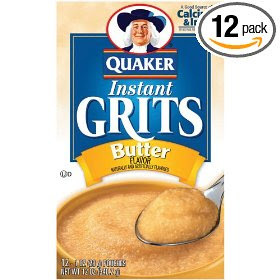 Quaker Instant Grits Butter Flavor received a score of just 6/100 from NuVal (formerly known as ONQI), my favourite food rating scale. Coming in a close second last was a more familiar name - Cap'n Crunch Sweetened Corn & Oat Cereal with a 10/100. So what's the healthiest cereal according to NuVal? Another unknown for me - Hodgson Mill Unprocessed Wheat Bran (Millers Bran) which received a perfect score of 100 with Red River cereal a close second at 93. This is why I love NuVal - it's incredibly easy to use. It takes 30 nutrients and 5 nutritional concepts and gives them to 11 of the world's leading nutritional scientists who then crunch them down in a weighted algorithm that spits out a rating between 1 and 100. Healthiest sugary cereal? Kashi Golean Crunch Protein & Fiber Cereal Honey Almond Flax with a score of 40. Most surprisingly unhealthy cereal? Cheerios with a score of 34.